Cincinnati Reds manager Pete Rose was suspended from baseball for gambling on games and coach Tommy Helms replaced him in late August in 1989. The Reds who finished ’88 with an 87-74 record fell to 77-87 in ’89. a much…. a do…. went on in the media over Pete Rose (Charlie Hustle as he was often called) gambling addition... so to calm things down Cincinnati management decided in early December to change some of its players as well. So this trade came about. Meanwhile, when the Mets won the 1988 NL East with a very fine 2.91 earned run average and after they finished second to the Cubs in their division in 1989 as their ERA went up to 3.29 they were eager to swap pitchers. Randy Myers, left-handed, pitching with the Mets, rang up a 7-3 record in 1988 with a stingy 1.72 ERA and posted 26 saves. The next season he had a 7-4 record, 2.35 ERA and 24 saves. In his first year with the Reds, 1990, Randy Myers gathered a 4-6 record, 31 saves and compiled a 2.08 ERA. John Franco, left-handed, had a 6-6 record in 1988, a miserly 1.57 ERA for the Reds with 39 saves. In ’89 he was 4-8 with a 3.12 ERA with 32 saves. In 1990 for John Franco compiled a 5-3 record with 33 saves and a 2.53 ERA. Kip Gross, right-handed, pitched in the minors in 1989. He started the 1990 season pitching for Nashville Triple A baseball and won two straight to open the season. Right after he was named the American Association Player of the Week, he was brought up to the majors by the Cincinnati Reds and pitched in his first MLB game on April 21, 1990, tossing a scoreless inning vs Atlanta. He pitched in 5 games and 6.1 innings for the year. In 1991 Kip Gross posted a 6-4 record for the Reds. Don Brown never played in the majors. Eric Davis was on the 'to acquire lists' of Dodgers general manager Fred Claire and manager Tommy Lasorada after the Dodgers ended the 1991 season with a 93-69 record, one game behind Atlanta. The Reds, who finished at 74-88 in 5th place 20 games out of first in the then two division National League, were looking to bolster a injury bogged pitching staff. So Eric Davis after eight outstanding years in Cincinnati was traded away. In 1986 his first season as the Reds starting centerfielder Eric Davis batted .278 with 15 doubles, 3 triples and 27 homers and stole 80 bases, 2nd in the NL to Vince Coleman of the Cardinals. The next season, 1987, the fleet-footed ballhawk batted .293 with a career-high 37 homers and compiled his first 100 RBI season. And, that's how it went for Eric Davis, one of the most popular players in Cincinnati Reds baseball history. However, He was injured in Game 4 of the 1990 World Series and suffered a lacerated kidney which caused an always felling fatigue, which caused him to miss all of August of the year of this trade. Eric Davis played 10 more seasons in the majors but his numbers never came close to his first 10 seasons in Cincinnati. Kip Gross worked as a reliever and spot starter during his rookie season for the Reds in 1991. He appeared in 29 games, had a 6-4 record, with a 3.47 earned run average, and completed 1-of-9 starts. In his first year after this trade Kip Gross was moved into the bullpen and in 16 games posted a 1-1 record with a 4.18 ERA. His last major league appearance was for the Houston Astros in year 2000. 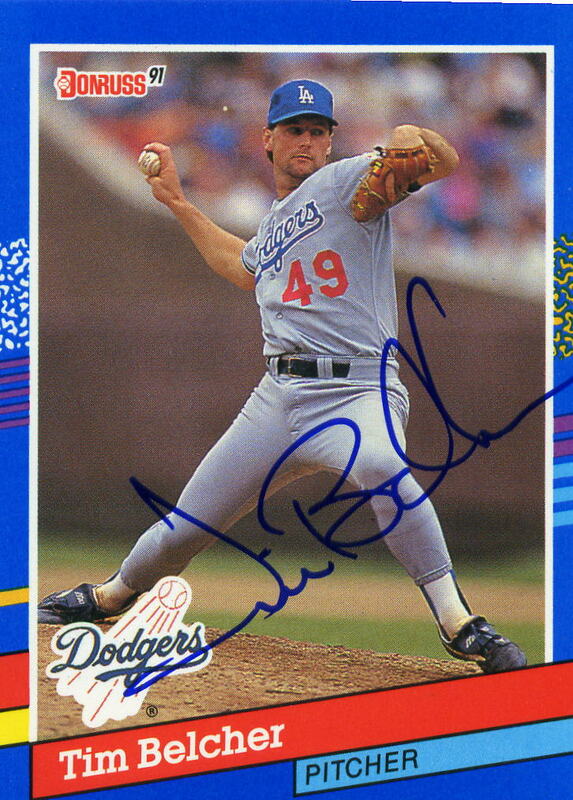 Tim Belcher won at least 10 games for the Dodgers in three of his last 4 years in LA, 12-6, 2.91 ERA in 1988... 15-12 with a 2.82 ERA in 1989 and a 10-9 with a 2.62 ERA in 1991. Well-regarded for a fastball during his early major league career, Tim Belcher used a drop-and-drive pitching motion like his boyhood hero Tom Seaver used. In his first year for the Reds, Tim Belcher added a slider to his pitching arsenal and posted a 15-14 record with a 3.91 ERA which helped the Reds moved up to 90-72 for the season, in 2nd place behind Atlanta. For career stats of all baseball players, please see Players section on our Home Page. John Wetteland went on to become of of the best relievers in this era. He collected 330 career saves in 618 games, walked just 252 and struck out 804 batters in 765 innings. John Wetteland pitched in the majors from 1989 thru 2000 and retired early due to arm problems. Height / Weight: 6' 3" / 220 lbs.